In drakish society, the term ‘blademaster’ is reserved for those who have mastered the deadly drakish war blade. Meanwhile, the golden-armored Swordmasters have chosen a different specialty. 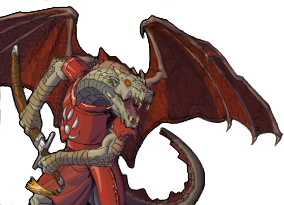 Their attacks may be slightly weaker than those of their Blademaster counterparts, but by using a lighter sword these drakes are able to wear heavier armour and yet still retain enough agility to strike more often than a Blademaster can manage.